I believe that it is important for people to learn about what is going on in their bodies and to participate in their own healing. After each massage session with a client I like to share a bit of feedback on what I noticed and if its appropriate, I offer some homework. Incorporating an effective stretch or strengthening exercise into daily routine will work in conjunction with receiving regular massages to help alleviate many somatic ailments. I try to recommend activities that are simple and efficient as to provided an enjoyable form of self-maintenance for in between sessions. One of my favorite and most common recommendations is to use a foam roller. The foam roller is exactly what it sounds like. A cylinder made of styrofoam. If you work out at a gym or take classes at a Pilates studio you have most likely seen them. Often found in the stretching area near the Physioballs, (another personal favorite) you will probably notice a few people rolling around on these toys. If you’ve never used one, perhaps you will wonder what on earth these people are doing. There are many uses for this simple apparatus, but the two predominate functions are self-massage and stability exercises. Rolling out on a foam roller is a form of self-massage that will bring increased circulation to the muscle tissue and the surrounding fascial layers. This involves using the weight of your own body against the roller to create pressure and then utilizing the circular shape of the tool to move along the pathway of the muscle group while sustaining the force. It’s a bit like ironing. Imagine that muscular adhesions or fascial restrictions are like wrinkles that might cause feelings of stiffness, soreness or limited flexibility. The foam roller becomes like an iron (unheated of course) that can be used to broaden out these kinks. By placing the roller on the floor and laying on top of it, gravity will allow the tissue to sink and soften onto the foam. This can be a bit uncomfortable in the beginning or on a day when the body is very stiff. The sensation may be similar to that of a deep tissue massage–a bit painful but in a ‘good way’ that quickly offers great relief. Using the roller as a prop for stability exercises is an easy method of gaining balance and core strength which can help improve posture. Having good skeletal alignment allows muscles to work effectively without unnecessary tension. Here are three great reasons to use the foam roller and how to do it. Tight Thigh Muscles Many people have tight muscles in the thigh region. The quadricep group covers the front of the thigh and the iliotibial band is a thick track of fascia that runs down the outside of the leg like a seam. The main action of the quadricep muscle group is to extend the leg at the knee joint. The iliotibial band stems from two different muscles of the hip. The tensor fascia lata, a small muscle towards the outside of the pelvis aids in thigh abduction and flexion at the hip joint and the gluteus maximus, a large muscle in the back of the hip that extends, laterally rotates and abducts the thigh. These two muscles feed into the band which continues down the thigh and crosses the knee joint before inserting on the outside of the tibia bone. The band helps to stabilize the knee. With the constant movement at the knee joint during normal activities like walking and running, the band often becomes very tight and in some cases may become inflamed due to friction. 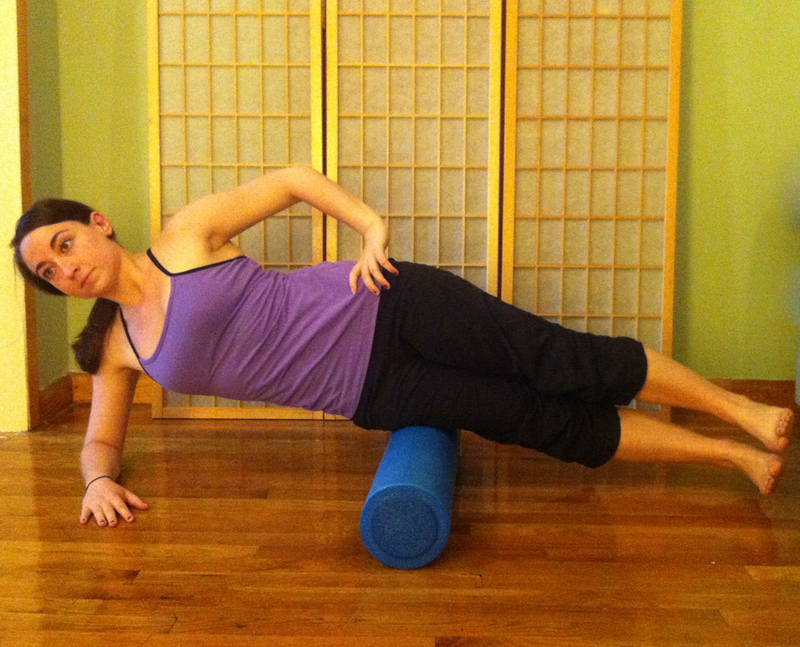 This can be a difficult area to stretch making self-massage on the roller an ideal way to loosen it up. Place the roller on the ground perpendicular to your body then lay the outside of your hip on it with your legs stacked on top of each other. Use your upper body to support yourself and slowly roll up and down between the hip and the knee. By turning your body to face downwards you will now have the front of your thigh on the roller and can roll up and down between the hip and the knee to release the quadriceps. Rolling slowly and taking deep breaths will help the tissue to relax. You will notice a clear change in sensation as the tissue softens so it is good to keep at it until you feel at least a slight release. Often strengthening muscles on the front and sides of the torso can be helpful in improving posture and alleviating back pain. 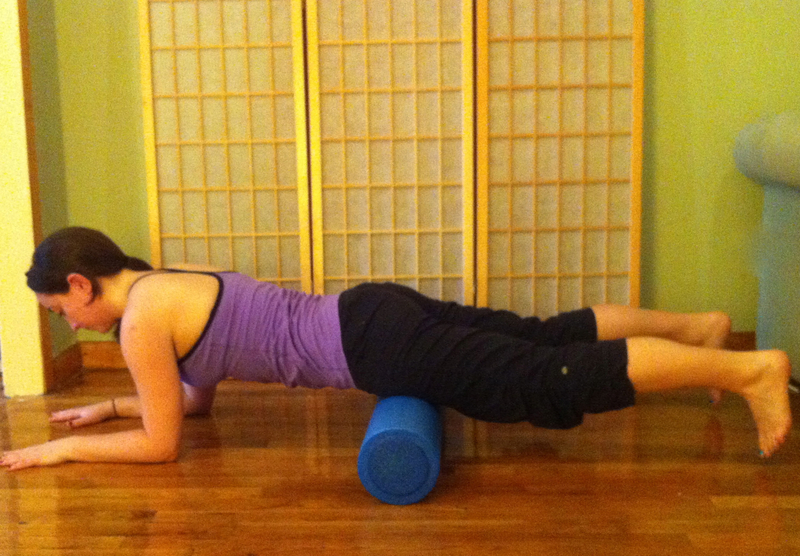 The roller can be a useful prop for some simple exercises that will strengthen the deep core stabilizers of the body. These muscles allow us to maintain good balance and alignment when in motion or stationary. For these exercises the roller serves as an unstable surface to balance on which provokes the stability muscles to engage. Knee raises are effective for this purpose and are simple but challenging. 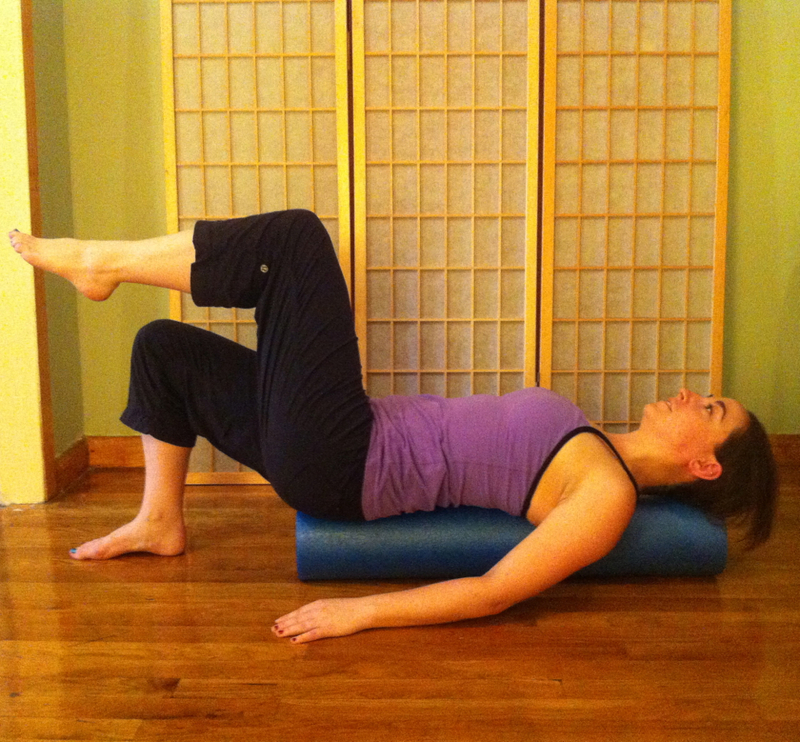 Start by lying on the roller so that it is running vertically along the length of the spine. Make sure that your head and sacrum are supported and place your feet flat on the floor with the knees pointing towards the ceiling. Lay your arms along your sides or out in a T shape gently pressing the palms of the hands into the floor. For an extra challenge try turning the palms face up. Moving one leg at a time, flex the hip and float the knee up towards your nose so that your thigh is perpendicular to the floor. Gently place the foot back down and repeat on the other side. Try to keep your navel pulling in towards your spine as you do this. It can also be nice to coordinate this movement with your breath by exhaling as your lift your thigh and inhaling as you lower it or vice versa. Most of us develop tight chest muscles from our daily occupations. Weather its working at a computer, driving or pushing a stroller we are often in positions that cause our chest to contract as we draw the shoulders and arms forwards…and leave them there for long periods of time. The roller is fantastic for chest opening stretches. Laying on your back with the roller running along the spine make sure the head and neck are supported and let the arms fall open towards the ground in a T shape with the palms facing up. Pretend that you are making snow angles and slowly drag the fingers along the floor upwards and overhead then back down along your sides. This will be a nice way to stretch the different parts of the pectoral muscles and will feel good on your neck and shoulders too. I love the foam roller because it is easy to use, safe and highly effective. As with any stretch or exercise, it will become easier and the results will be more noticeable if done regularly. One to three times per week is a good goal for general maintenance. If you belong to a gym check to see if they have one and if not inquire if it is something they could order. If you would like to purchase your own, they are sold online or at most sporting good stores. Foam rollers don’t take up much space and are affordable costing approximately thirty to forty dollars. This is an excellent way that you can work with your massage therapist to maintain and augment your progress.